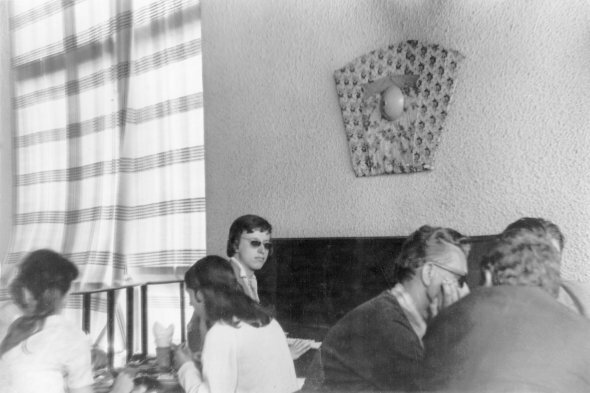 Cafés were important exhibiting spaces for unofficial art. 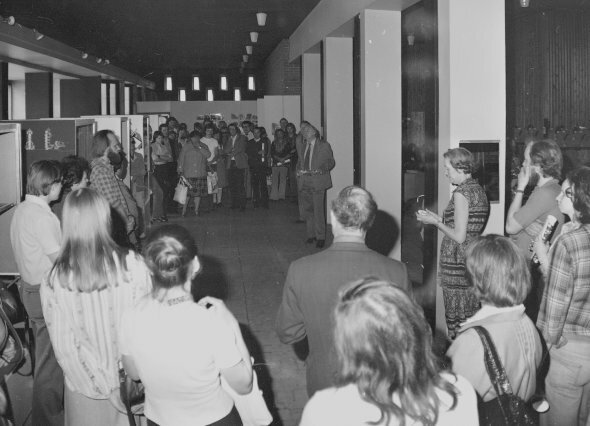 However, the Writers’ Union’s Café Pegasus was an official exhibition space for which the Artists’ Union was responsible. Still, censorship was milder there, and it gave young artists the chance to present their work. In December 1969 the legendary Pop Art exhibition “SOUP’69”—the poster depicted a Warhol soup can being “pried open by Estonians”—proclaimed the arrival of Pop in Estonian art. 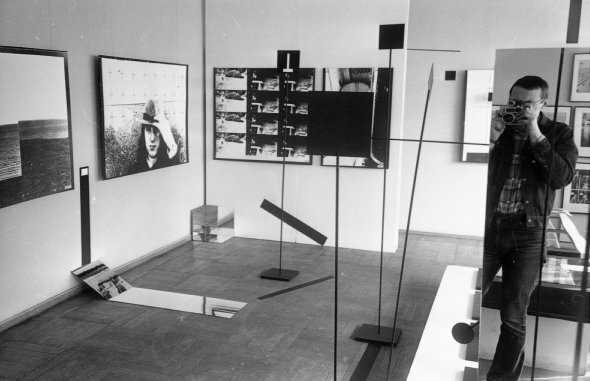 The exhibition “Estonian Avant-Garde Art” that opened as part of the third International Finno-Ugric Days was supposed to become a group exhibition of the most radical Estonian art groups active at the time: ANK’64, Visarid, and SOUP’69. However, due to changes in the political situation, many artists decided not to participate. 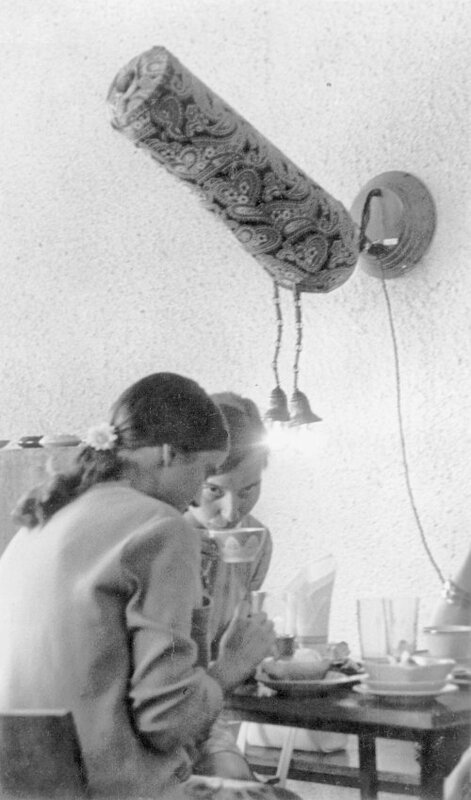 ANK’64 was the first artist’s group in the Soviet period. 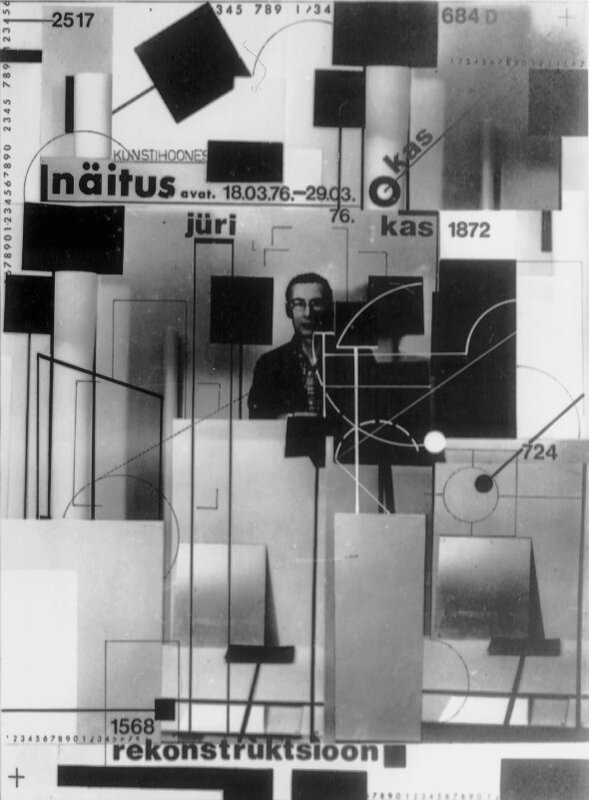 It formed 1964 from the students of printmaking at the State Institute of Art, including Tõnis Vint, Malle Leis (1940), Jüri Arrak (1936), Kristiina Kaasik (1943), Tiiu Pallo-Vaik (1941), Enno Ootsing (1940), Tõnis Laanemaa (1937), Aili Vint (1941), Marju Mutsu (1941-1980), Vello Tamm (1940-1991). Their pursuits in art were connected with youth culture, Pop and Op Art, as well as with the Avant-Gardes of the early 20th century. The artist’s group Visarid formed 1968 around the art studio of the Tartu State University and the head of the studio Kaljo Põllu (1934-2010). Other members were: Peeter Lukats (1933), Jaak Olep (1945-2000), Rein Tammik (1947), Enn Tegova (1946), Peeter Urbla (1945), et. al. Visarid advocated “total art”, art that do not design individual commodities, but reorganize the hole environment. 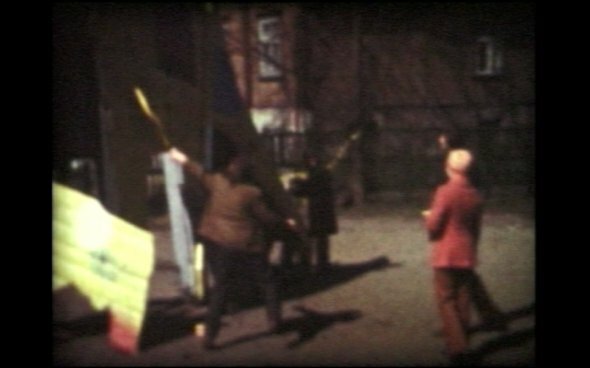 The group dissolved 1972. 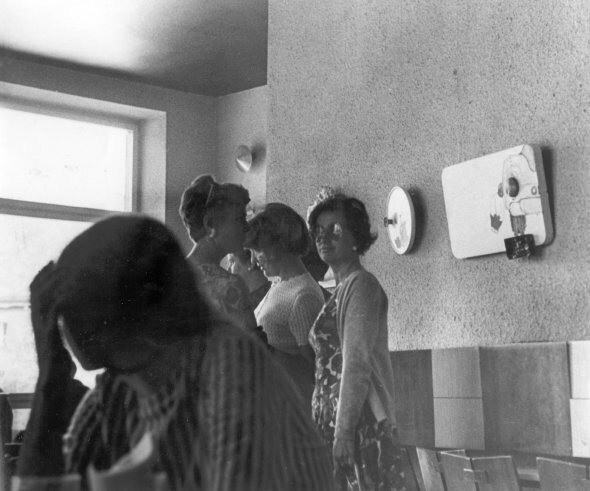 In aftermath of the Prague Spring events the pressure on artists as well as other members of the society got higher, the system got more repressive. Filmstills. Jüri Okas. Elephant. 1971. 8 mm, b/w, colour, 15 min. Filmstill. Jüri Okas. Elephant. 1971. 8 mm, b/w, colour, 15 min. Participants: Ülevi Eljand (1947), Tiit Kaljundi (1946-2008), Ando Keskküla (1950-2008), Vilen Künnapu (1948), Leonhard Lapin (1947), Avo-Himm Looveer (1941-2002), Kristin Looveer (1947), Jüri Okas (1950), Jaan Ollik (1951), Sirje Runge (Lapin) (1950), Andres Tolts (1949), et al. 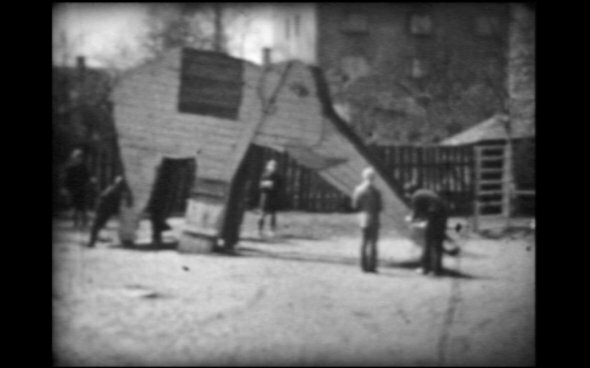 The opening of the 1971 exhibition of independent student works at the State Art Institute in Tallinn culminated in the happening “Colouring the Elephant” in a nineteenth-century suburb of Tallinn. During the happening, a large group of art and architecture students repainted a run-down children’s playground that had a wooden elephant slide in the middle. The event was initiated by artist and design student Andres Tolts, who had a studio in the neighborhood. It was officially sanctioned as a renewal project and paint was provided by the local municipal housing committee. 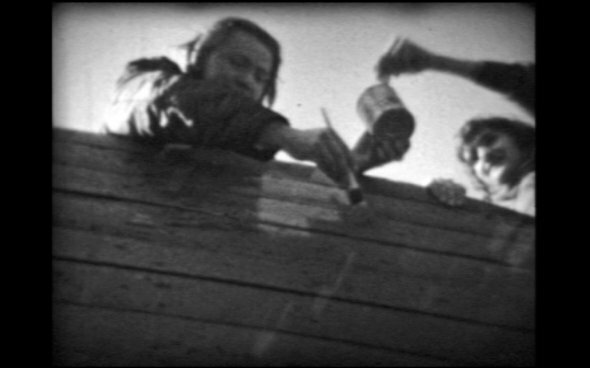 The happening is documented in Jüri Okas’s film Elephant (8 mm, color, 15 min.). Happenings, walks through neglected areas and wastelands of the city—“places abandoned by socialism that had themselves abandoned socialism,” as Lapin put it—and interest in strange and uncanny encounters had all been among the practices of a group of young architecture students since the late 1960s. 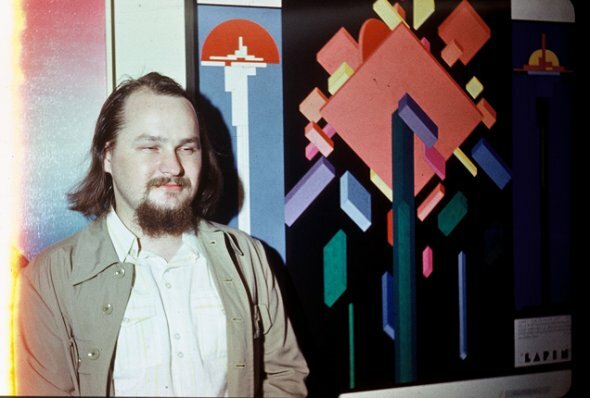 In 1972, a year after “Coloring the Elephant,” architect Vilen Künnapu and poet Juhan Viiding published their article “A Proposal” in the main cultural newspaper. The article called for a rediscovery of the neglected spaces of Tallinn—its anonymous courtyards and wooden dwellings—and suggested that they “modestly supplement them with beautiful vibrant colors.” Emphasizing the aesthetic value of elevator shafts, staircases, external plumbing, and ventilation ducts as anonymous works of art, they pleaded for them to be enhanced with color. 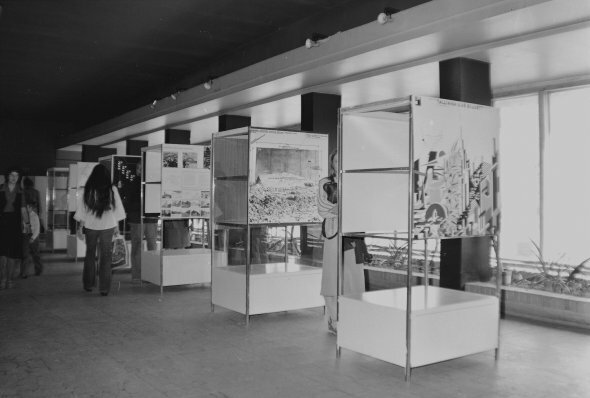 The blank walls of industrial structures were to become exhibition spaces filled with posters and images. In his speech “Art Designing the Environment” at the same exhibition of independent student works, Lapin proclaimed that “the human living environment has become the central concern for contemporary culture.” Lapin criticized “beautiful art” as merely a decorative form of commodity, and confronted it with art that contributes to the production of new environments. Both design and happenings were intended to help achieve this goal. Ideas such as those announced by Lapin would define art practice during the following years; among the defining characteristics of these practices was their interdisciplinarity. 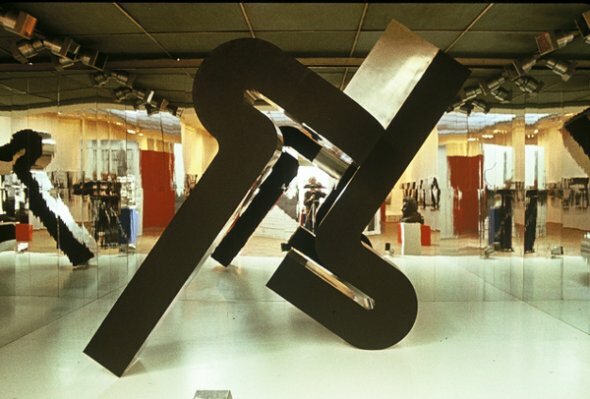 The main exhibition was a retrospective of twentieth-century Estonian monumental sculpture. 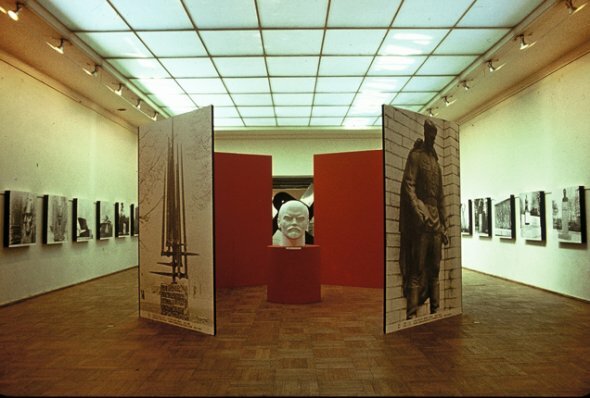 In the main hall were photographs of monuments from the Soviet period with a bust of Lenin in the center. 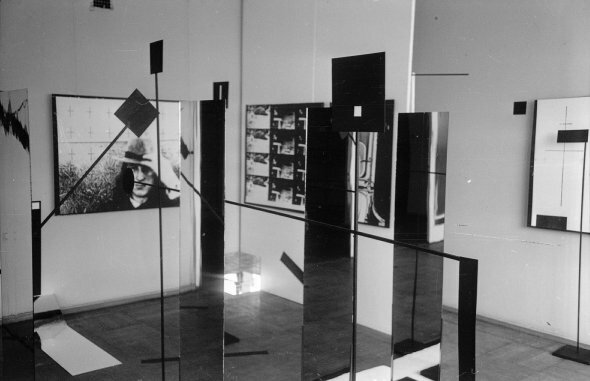 In smaller halls were decorative sculpture and some constructivist forms from the 1920s, and in the farthest room from the entrance was the small show of experimental works. 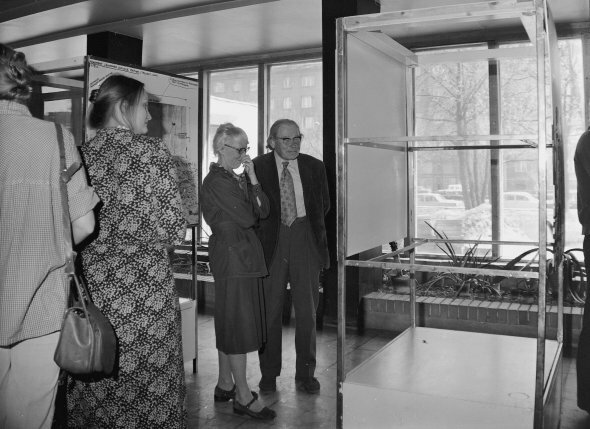 The latter featured designs and models by architects, as well as abstract paintings, prints, and kinetic objects, and a separate brochure was provided in addition to the main catalog. The abstract artwork might be considered as way to camouflage monumental designs—a tactic often ascribed to unofficial art, enabling works to be exhibited that did not conform to official standards. However, this show was different in that it included architects, designers, and artists equally, without differentiation. The goal of this intervention was not merely camouflage, but the transformation of the official genre, to re-shape it into an extensive design of public space. An anonymous review (actually written by Lapin), published in the local arts magazine Kunst, explained that the new monumental art was moving away from the design of single monuments and towards the organization of total environments. Architecture as well as street lighting systems would be the field for this new art. The idea for the exhibition was related to discussions on monumentality and monumental art in the Soviet Union and also to the crises that had arisen since the 1960s concerning the new modern industrially constructed city—itself in need of a new kind of monument. Representational monumentality was confronted with a new kind of synthesis based on art, architecture, and new technologies. It was about the creation of new city structures and, as result, a different kind of public space. Lapin used the exhibition format to make a statement and to open dialogue with official art. His exhibition design used the colors of the French national flag— blue, red, and white—to refer to ideas of freedom, brotherhood, and equality. 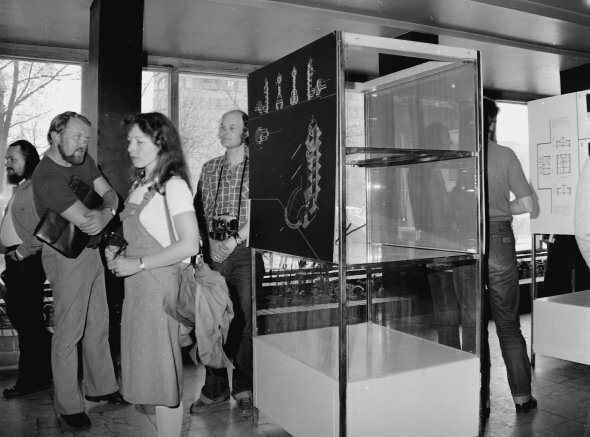 The foyer of the Academy of Sciences Library, situated in the center of Tallinn opposite the local Communist Party Central Committee building, was generally a site for exhibitions on the lives of important scientists. 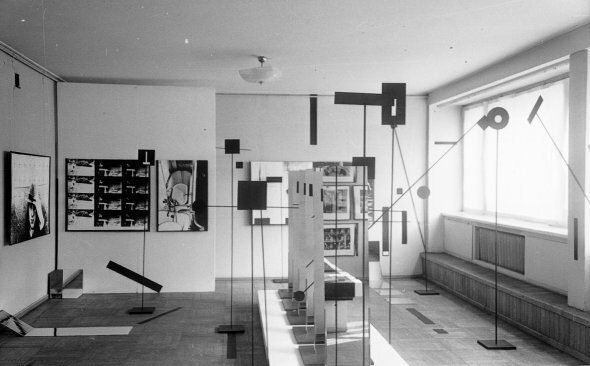 Many scientific institutions in the Soviet Union were already offering space for progressive art exhibitions, and the Academy of Sciences Library had also hosted shows in the past: for example, in 1966, an exhibition of art and photography. 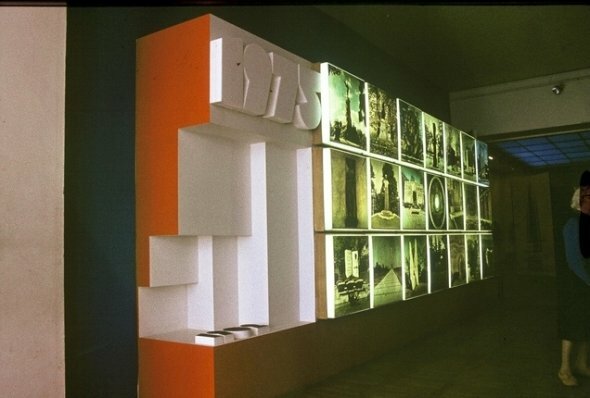 The idea of the exhibition originated with the 1972 manifesto “Program for an Exhibition of New Architecture,” signed by Tiit Kaljundi, Leonhard Lapin, Vilen Künnapu, Avo-Himm Looveer, and Ülevi Eljand. The manifesto marked the beginning of a process of rethinking architectural practice in Estonia instigated by a group of friends and colleagues who later became known as the Tallinn School. 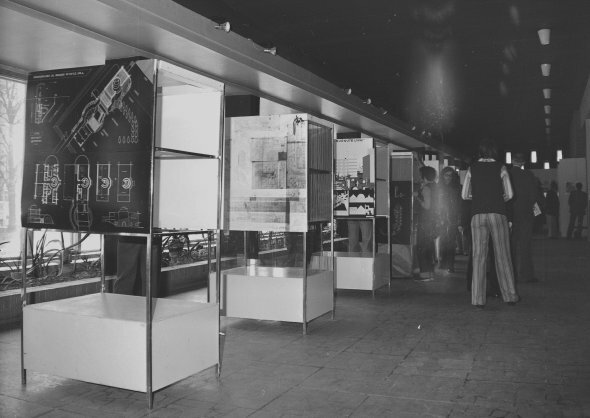 The exhibition format was utilized as an effective medium for communicating ideas about architecture, and for engaging the wider public in a discussion about the practice and goals of architecture. 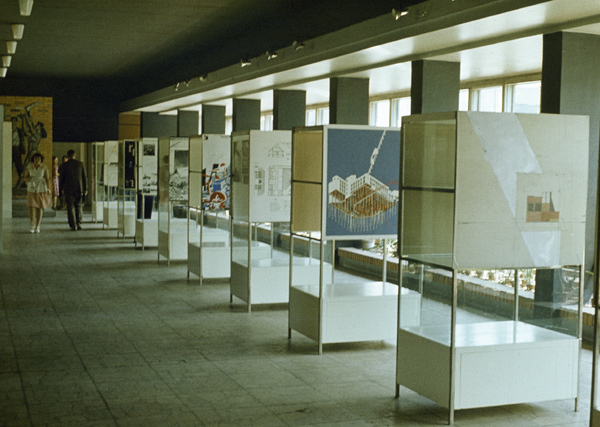 The exhibition was critical of Soviet mass construction, standardization, and modernist urban planning. At the same time, it posed questions about the institution of architecture and about architectural representation. 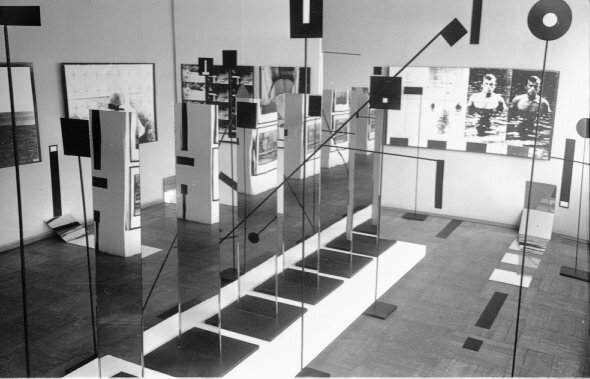 The exhibition was divided into two parts: black-and-white photographs showing examples of built works and—the sensational part of the show—pieces drawn on cardboard panels, each one meter squared, which lined the large glazed wall of the foyer. These pieces presented critical and ironic commentary on architecture and the modern city, and they adopted the standard format used by the state architecture offices for exhibiting architectural designs. Their unusual execution and content were new and surprising. 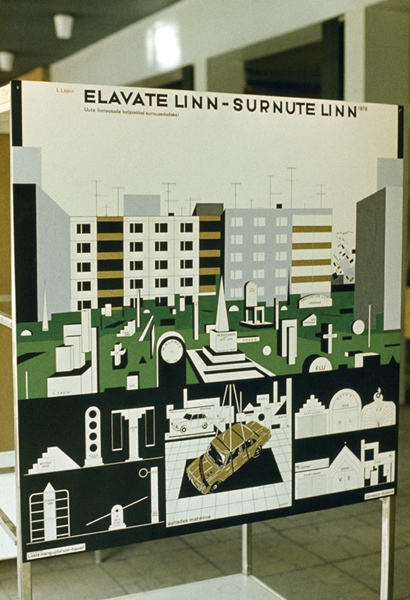 One of the crucial works in the exhibition was Lapin’s The City of the Living—The City of the Dead. The design proposed the creation of cemeteries in the green public spaces between the panel houses of the new housing districts. The cemeteries would include garage-tombs, in which bodies could be buried inside cars. The gravestones would function simultaneously as a children’s playground. This ironic proposal was intended to “complete” the micro housing districts, so that “inhabitants could remain in their neighborhoods forever without ever having to traverse a single highway.” In addition, the design made direct reference to official architectural institutions: it included a communal grave for the Architects’ Union and a grave for the union head, Mart Port, with the epigraph, “M. Saddamm—the leader—1922–1979” (indicating that Port was expected to die the following year—in reality he was to resign as head of the Architects’ Union). The design also included graves for Lapin himself and his fellow architects. It can be understood as a political statement. Many of the exhibited works used irony as a tool for criticizing and questioning the ways in which we think about architecture. The exhibition prompted many responses in the visitors’ book as well as in the media, where nonprofessionals commented on the exhibition. Reviews were also published in Finland and the GDR.